Having arrived on this page you have probably surfed the Internet and scoured books and journals in search of the history of SWOT Analysis. 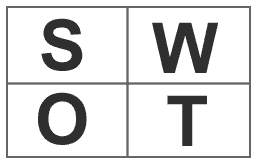 The simple answer to the question What is SWOT? is that there is no simple answer, and one needs to demonstrate a little academic wisdom in that nobody took the trouble to write the first definitive journal paper or book that announced the birth of SWOT Analysis. A refocusing of SWOT was offered by Panagiotou (2003). He introduces a TELESCOPIC OBSERVATIONS strategic framework which in effect maps strengths, weaknesses, opportunities and threats against his suggested acronym – TELESCOPIC OBSERVATIONS. So, for example T = technological advancements, E= economic considerations, L = legal and regulatory requirements, etc. The most useful aspect of Panagiotou’s article is that not only does he recognise the difficulty in finding the origins of SWOT, but he also manages to unearth some interesting alternatives. In contrast to crediting the tool to Stanford University’s Albert Humphrey, SWOT is credited to two Harvard Business School Policy Unit professors – George Albert Smith Jr and C Roland Christiensen during the early 1950s. Later in the 1950s another HBS Policy Unit professor Kenneth Andrews developed its usage and application. All professors were specialists in organizational strategy as opposed to marketing. SWOT went on to be developed by the HBS during the 1960s until SWOT became the tool that we use today. There are a number of contrasting, if not contradictory views on the origin of SWOT. Here are a few of the leading thinkers on the topic (and if you have more please let us know so that we can add them). Stanford University’s Albert Humphrey led a research project in the 1960s-1970s based upon the United States’ Fortune 500. Humphrey lead a research project which ultimately developed his Team Action Model (TAM) which is a management concept that enables groups of executives to manage change. SWOT was to have originated from his ‘Stakeholders Concept and SWOT Analysis.’ However, if one proceeds to find out more about the author in academic libraries there is nothing accredited to him. It is unusual for such a prolifically cited piece of research not to have an original definitive publication as its centrepiece. The TAM approach is one of a number that are used by trainers around the World, although for us the crediting to Humphrey as the creator of SWOT cannot be supported. King (2004) also recognised that it was tricky to track down the origins of the acronym SWOT. He cites Haberberg (2000) as stating that SWOT was a concept used by Harvard academics in the 1960s, and Turner (2002) attributing SWOT to Igor Ansoff (1987), of Ansoff’s Matrix fame. Koch (2000) considered the contributions of Weihrich (1982), Dealtry (1992) and Wheelan and Hunger (1998). Again whilst these are the commonly accepted views of thinkers on the topic of SWOT, even the common observer would recognise that Weihrich (1982) was not the originator of the concept but rather an innovator of it. As Koch (2004) comments he recognised that a series of SWOT/TOWS analyses had the advantages of a single arbitrary matrix. Wheelan and Hunger (1998) used SWOT to look for gaps and matches between competences and resources and the business environment. Dealtry (1992) considered SWOT in terms or groups and vectors with common themes and interactions. Shinno et al (2006) amalgamated SWOT analysis with an Analytic Hierarchy Process (AHP) which ranked and prioritised each element using software. Shinno et al (2006) do not really deal with the obvious limitations of SWOT (see our SWOT lesson for a refresher). Again despite their interest in the concept of SWOT Analysis, none of these respected authors actually cite its origins. It may be that SWOT’s origins have been forgotten and are confined to the corner of the library labelled ‘folklore.’ It may be that SWOT originated in a number of places, or became common place in the training rooms of corporate America in the 1950s and 1960s. One thing is true and that is if you conduct your own review of the literature on SWOT that there is no obvious history of thinking on the topic i.e. that it has no documented epistemology. In this case – marketing student beware! Web based searches proclaim to have an answer to What is SWOT? but they do not. They perpetuate plagiarised views. There is no documented history of SWOT – that is the answer! Ansoff, H.I. (1987), Corporate Strategy, revised edition, Penguin Books. of Marketing Intelligence & Planning, Vol 14, 4, P 16-23. Dealtry, R. (1992) Dynamic SWOT Analysis, DSA Associates, Birmingham, Haberberg, A. (2000), “Swatting SWOT”, Strategy, (Strategic Planning Society), September. Hill, T. & R. Westbrook (1997), “SWOT Analysis: It’s Time for a Product Recall,” Long Range Planning, 30, No. 1, 46-52. King R.K. (2004), ENHANCING SWOT ANALYSIS USING TRIZ AND THE BIPOLAR CONFLICT GRAPH: A Case Study on the Microsoft Corporation, Proceedings of TRIZCON2004, 6th Annual Altshuller Institute. Koch, A.J. (2000), SWOT Deos Not Need to be Recalled: It Needs to be Enhanced, http://www.westga.edu/~bquest/2001/swot2.htm – accessed 15th September 2008. S.F. Lee, K.K. Lo, Ruth F. Leung, Andrew Sai On Ko (2000), Strategy formulation framework for vocational education: integrating SWOT analysis, balanced scorecard, QFD methodology and MBNQA education criteria, Managerial Auditing Journal Vol 15 (8), pp407-423. Menon, A. et al. (1999), “Antecedents and Consequences of Marketing Strategy Making,” Journal of Marketing, 63, 18-40. Piercy, N. and Giles, W. (1989) Making SWOT Analysis Work Journal of Marketing Intelligence & Planning, Vol 7, Issue 5/6, P 5-7. Panagiotou, G. (2003) Bringing SWOT into Focus, Business Strategy Review, Vol 14, Issue 2, pp8-10. Shinno, H., Yoshioka, S., Marpaung, S., and Hachiga, S. (2006), Qualitative SWOT analysis on the global competiveness of machine tool industry, Journal of Engineering Design, Vol 17, No.3, June 2006, pp251-258. Tiles, S. (1968), Making Strategy Explicit, in I. Ansoff (ed), Business Strategy, Penguin. Turner, S. (2002), Tools for Success: A Manager’s Guide. London: McGraw-Hill. Valentin, E.K. (2001), SWOT analysis from a resource-based view – journal of marketing theory and practice, 9(2): 54-68. Wheelan, T.L. and Hunger, J.D. (1998), Strategic Management and Business Policy, 5th Edition, Addison-Wesley, Reading, MA. Weihrich, H. (1982). The Tows Matrix – a Tool for Situational Analysis, Long Range Planning, April (60).